Ecolibrium Solar, the racking solution provider leading the industry in innovative, simple solar mounting solutions, today announced the new EcoFoot5D™ High Density 5-Degree Racking System. 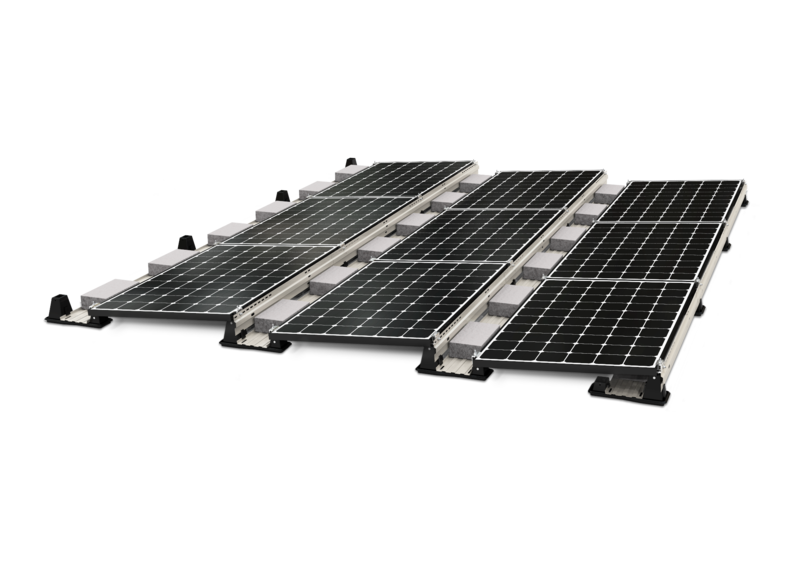 Built on the Industry-Preferred EcoFoot® Modular Platform with more than 200MW installed, the EcoFoot5D combines a small 7”x16.7” roof-friendly modular Base and dense 9.9” inter-row spacing. The result is a tightly packed array that delivers 18.4 percent more power than 10-degree systems. “Developers asked for a high-density solution that installs as easily as our EcoFoot2+ product. We’re very pleased to announce the EcoFoot5D. Customers have experienced the simple work flow and cost-saving logistics of the EcoFoot platform and wanted to use the same technology for 5-degree installations,” says Sam Veague, chief operating officer for Ecolibrium Solar. EcoFoot5D is comprised of five preassembled components and requires only one tool for installation. Bases fall into alignment as modules are placed. Preassembled parts eliminate the need for PV panel preparation. The combined effect is an organized workflow and non-stop installation process from box to roof. System advantages include streamlined logistics due to the low part count and Bases that stack to deliver 290kW of Bases on one standard pallet. Installation is easy from start to finish, aided by accessible and protected wire management. Wires are covered by the system yet easy to access throughout the life of the system via a removable Wind Deflector. Ballast blocks are easily placed between rows in the Ballast Tray, eliminating under-module ballast placement and awkward reaching. Suited for modules ranging from 32-50mm, the clean aesthetics and low profile are perfect for residential and commercial flat-roof installations. EcoFoot5D is backed by a 25-year warranty. For more information, contact [email protected], call 740-249-1877, or visit www.ecolibriumsolar.com. With more than 600MW installed on flat and pitched roofs nationwide, Ecolibrium Solar® is a market leader in solar racking solutions for commercial and residential rooftops. The company designs and manufactures simple, cost-effective, and installer-friendly products that maximize solar installation efficiency and minimize costs. Our world-class, innovative mounting solutions are delivered with unparalleled service and support by dedicated, expert staff. In the global solar market for innovative, lower-cost, labor-saving racking technology, Ecolibrium Solar provides proven solutions backed by industry certifications and third-party validations. For more information, visit www.ecolibriumsolar.com.